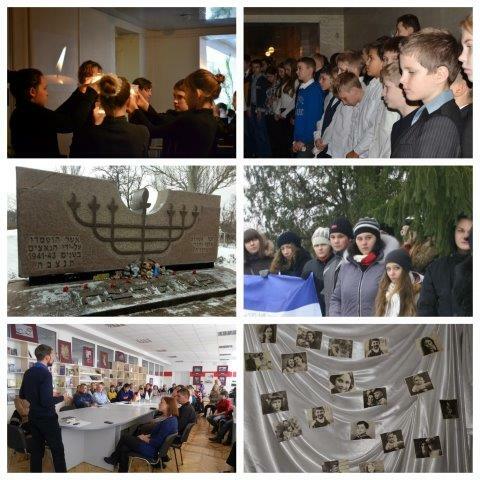 January 27, several events dedicated to the International Holocaust Remembrance Day took place in Zaporozhye. Students of “Yakhad-Maccabi” Jewish Sunday School and members of the Maccabi Zaporozhye Club attended a rally held at the Memorial of Victims of Fascism, installed at the site where 36,000 residents of Zaporozhye were shot between October 1941 and October 1943; among them 27,000 were Jews – almost the entire Jewish population of Zaporozhye, who had not managed to evacuate. Students of “Yakhad-Maccabi” joined the action “We Remember”; they prepared a thematic musical and literary meeting dedicated to the Shoah. January 25, Maccabi Zaporozhye activists held a panel discussion entitled “Holocaust Lessons,” in which Maccabi members, students, representatives of national societies, and caring people of Zaporozhye took part. The panellists noted that it is necessary not only to remember the history, but also to talk about the existing discrimination in modern society. “We have no right to ignore the occurring manifestations of hatred in society, in social networks, in public and even cultural space. Ignoring them can lead to disastrous consequences ”, said the student Alexander Larin.